Product Spotlight - QC-CALC 4.0 Released!!! Finally, after 4 years of development, QC-CALC 4.0, GageStation/QC-Gage 4.0, and SPC Office Buddy 4.0 were officially released this week. This is by far, the largest change to the software in our history. 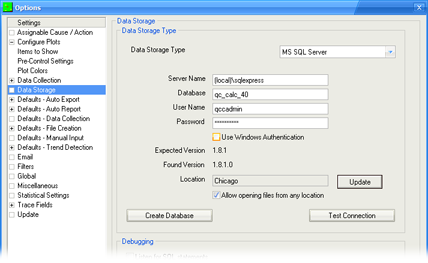 We have replaced the QCC file with two new options; the QCQ file and Microsoft SQL Server. You now have the option of choosing either (a) the file-based option (default) or (b) the server-based option allowing QC-CALC to read and write directly to your SQL Server. Overall, QC-CALC should look and act very similar to the way it did with the QCC file, but there are several benefits to this change. The largest to be realized over the coming months is a tighter and more seamless integration of features across products and a simpler menu of products from which to choose. Direct access to SQL Server - For smaller implementations, QC-CALC will act the way it always has. For larger implementations, QC-CALC can write directly to SQL Server skipping the need for Enterprise Data Loader. Portability - The file-based QCQ file is now portable without the need for extra files with other extensions (QCN, EIF, ET3, NTS, P11, etc). Flexibility - The new database design allows Prolink to add functionality directly into the database within the same software version without the backward compatibility issues with QCC files. New Filtering - The powerful Enterprise Report Scheduler record filtering has been ported to QC-CALC and SPC Office Buddy allowing greater access to data than ever. Snapshots - A new feature called Snapshots has been added that allows the importing of 2D/3D CAD/solid model drawings into Enterprise Report Scheduler in order to mark characteristics for display. These pictures automatically appear in QC-CALC 4.0 and QC-Mobile 4.0 automatically as characteristic pictures. Location & Categories - If using SQL Server, location and categories have been added for improved grouping and categorization of part files in a multi-user environment. Come visit us at Booth 135415 in the East Building! Over the years we have heard from customers that want to get capability statistics from data when the data is non-normal. Typically they are looking for statistics on single-sided form tolerances such as true position or flatness where the target is zero. When this type of tolerance is used, you tend to get half of a bell curve which inevitably causes the data to be non-normal and the Cpk can no longer be trusted. In these applications, you will start seeing values of N/A or -999999. 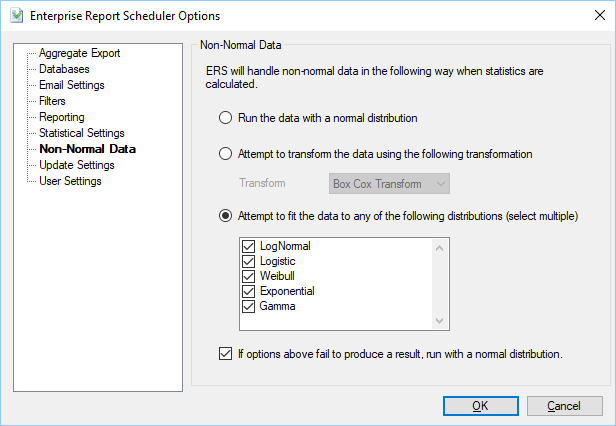 As of 2018, we are now offering new options for dealing with this type of data that include transforming it or fitting it to a non-normal distribution. This is a relatively new but powerful feature and has been added to ERS and QC-Mobile so far with plans to implement it in QC-CALC Real-Time and SPC Office Buddy over the coming months. Once set up, all statistics throughout the application will automatically follow these settings. In the case of distributions, the best outcome will be chosen for each characteristic and the result will be reported in a separate field. For instance, one characteristic fit a Weibull and another fit a LogNormal distribution. This new feature is included in the latest revision of ERS 3.4 and QC-Mobile 4.0. Simply download and update to the latest to take advantage!